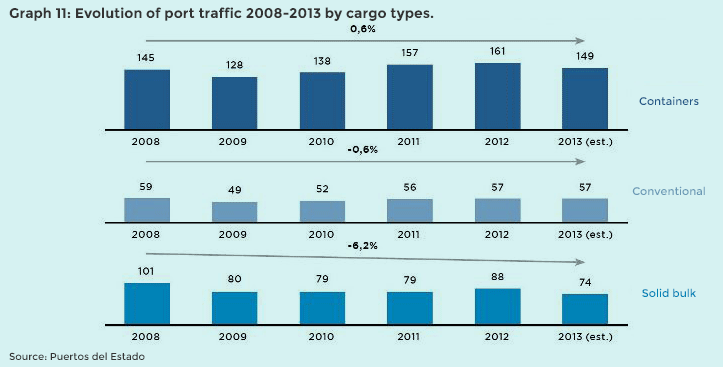 From 1992 until 2008, freight traffic in Spain had an annual growth rate of 4.4%. During this period, many of the concessions that currently enable the provision of services in the ports were granted to different private investors. The investors’ business plans were based on the hypothetical continuity of this historic growth under the concession and fees model established by Puertos del Estado. The continued increase of the system’s capacity has only heightened the decline in volume at the terminals, generating aggressive competition and exerting a strong downward pressure on prices. It is worth mentioning that in 2013, MsC transferred part of its traffic to Italian ports such as Gioia-Tauro or to Sines in Portugal, and the most immediate consequences are beginning to appear, with some terminals that have already filed for a suspension of payments. This loss of profitability is due to 3 main reasons: the decline in traffic, overcapacity existing in the system, and high costs and inflexibility of port fees and labour. The global economic crisis led to a decline in traffic from 13% in 2009. Despite the fact that the total volume of freight steadily increased until recovering its pre-crisis figures in 2012, interruption of the aforementioned historic growth resulted in aggregated losses for the port operators equivalent to more than one year of annual business volume expected (more than 502 MTon) from 2008 to 2013. The situation in 2013 does not look positive, and based on the results of the first 6 months of 2013, there is a 5.6% decline in traffic with respect to the first half of 2012. Additionally, the volume of traffic managed by the port operators have actually suffered a more substantial decline than that shown by the statistics of Puertos del Estado, which is having a strong impact on the port operators’ margins, and as a result, on the return of the investments made. The traffic in 67% of the bulk terminals that fall within the PIPE platform is decreasing at a rate of 9% per year in comparison to the 6% shown by Puertos del Estado, exhibiting a sharper decline in the first 6 months of 2013 which amounts to 17%. 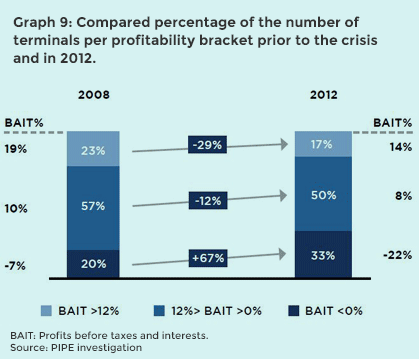 Likewise, 56% of PIPE’s container terminals that were analysed show a negative trend with an annual average decrease of 17% for the period between 2007 to 2013, a situation quite contrary to that shown by the statistics of Puertos del Estado in which the volume of traffic remained steady between the period of 2008 to 2012. The same cannot be said of the other stakeholders in the ports such as the PAs, with a business model which, despite the economic crisis, has maintained its revenue levels obtaining an EBITDA margin of 57%1 in 2011. 2009 meant a 16% decline in port activity, a situation that had never happened before in the Spanish port system. Since then, the activity of loading and unloading operators has evolved, reaching 473 million tonnes in 2012, a figure still much lower than that of 2008. The forecast for 2013 is not much better than the previous year. The volume of activity lost in comparison to the expected volume will reach the amount of 700 million tonnes, a figure greater than one full year’s activity. The main consequence of this is that the investors’ expected returns have fallen far short of the mark. Given that it is no longer possible to recover the volume lost, the only way to get the profitability figures back on track would be to extend the concession periods, a measure that has negligible impact on the port system’s accounts. Our studies show that the container facilities—the main focus of the current port investments—will have an occupancy of 36% once the planned investments have been completed. Of this occupancy, transshipment only contributes 20%. The number of terminals with a use greater than 50% is very small. Only Las Palmas, Valencia, Algeciras, Sevilla, and Vigo have acceptable occupancy ratios. On the other hand, the model of fees and minimum traffic generates huge margins and cash surpluses for the Port Authorities. This surplus fosters the continuity of the flow of Public investments, all of this in spite of the existing overcapacity. For 2013 and 2014, there are planned investments amounting to 563 and 648 million euros respectively. In the container business and for the decade between 2003 to 12, unit revenues are up by only 15%, whereas the occupancy fees exceed 20% and labour is 40%. Strangely enough, this disparity has been further heightened since the beginning of the crisis in 2008. The study obtains similar conclusions for the bulk business, with increases in unit labour costs (+20%) and occupancy fees (+14%), whereas unit revenues are only up by 4%. This trend in costs and revenues has a strong impact on profitability as the fees and labour constitute approximately 70% of an operator’s costs. The salaries of stevedores are high. They almost triple that of other workers in other sectors with the same qualifications and responsibilities. At present, the port operators have little flexibility to outsource outside the system, although this could change over the coming months as a result of its revision by European legislation. The occupancy fees constitute 80% of the total expenses in fees that a port operator has to shoulder. These fees have continued to increase over the last few years, without adjusting to the current land valuation in the real estate market (with an average decline in value of 44% during the period from 2008 to 2012), ensured by the Law of Ports in Article 177. This situation only further contributes to damaging the private investors’ profitability, whereas Puertos del Estado’s economic self-sufficiency is ensured by the regulation in force.